It is very enjoyable researching anvils and anticipating which one you might get. I looked at many used anvils and many new ones. The prices for used anvils, that may have required repair work, were so high, that I just bought a new one. 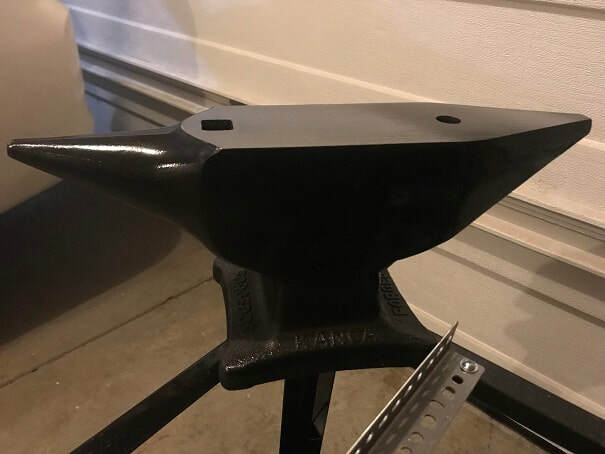 In many ways I would have preferred to find a good used one, and seeing as how I bought a small new one, I will still have a chance to buy an old big anvil if I need a larger anvil later. I bought my anvil and initial tools from Centaur Forge, which was a great place to visit; I am within driving distance so saved some money on freight. Old smithys sunk a big hardwood log vertically down into the earth and then mounted their anvil on top....so that's what I did. This is a white oak log from a nearby tree that had fallen down in a storm. The hole is about 4feet deep. I dragged the log to the hole and bedded and surrounded it with stone in the hole. 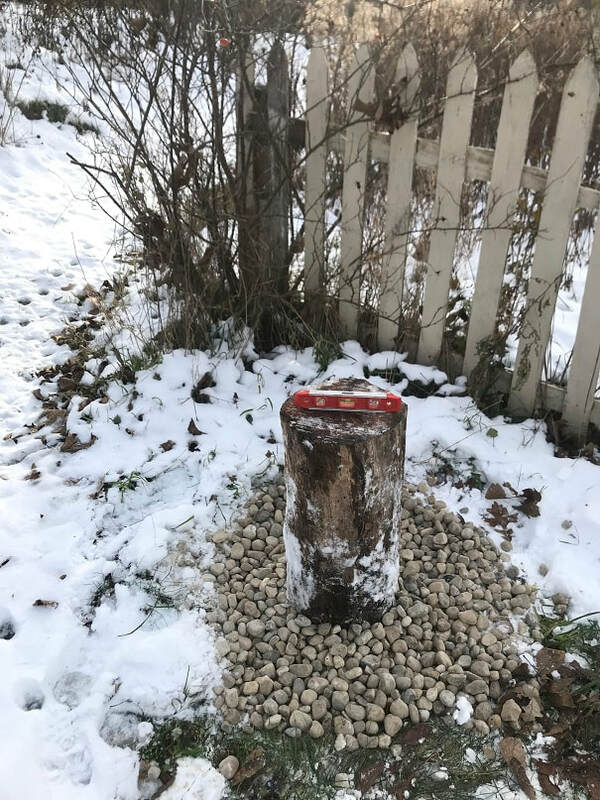 This Oak log buried in the ground will be my anvil stand. ANVIL HEIGHT: The top of your anvil should be at the height of the bottom of your fist when you arm is hanging at your side. I have read that bedding your anvil in sand works well, so that is what I did. 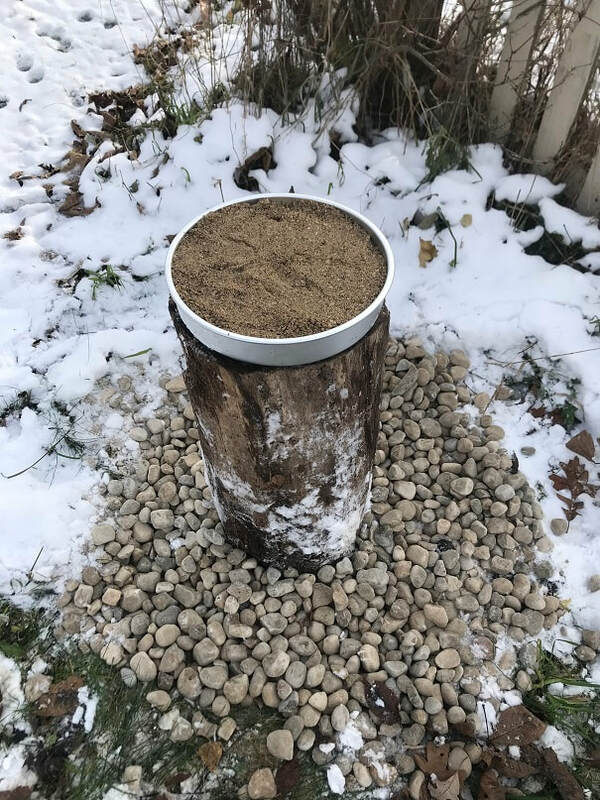 I nailed a steel pan, the same diameter as the log, to the top of the log, then I filled it with paver bedding sand. 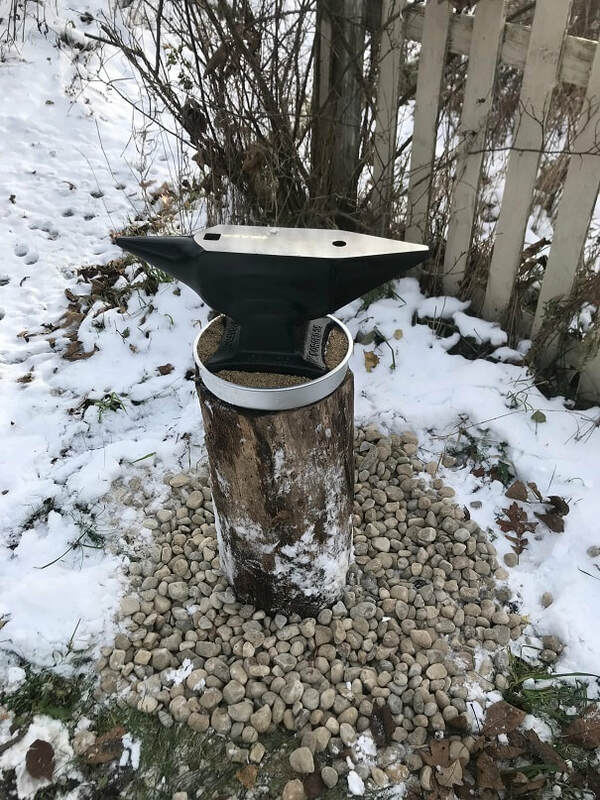 Here is my anvil on the buried-log anvil stand. Completed early November 2018. I set up a small work table to rest tools on, and I also mounted the my vise to this table. I selected a 5" Irwin vice. Keep in mind all this equipment needs to be portable, as I carry it outside, but store it inside. This kept me from getting too large with any of the tools. A proper blacksmith vise has long legs that mount to the floor to transfer hammering loads to the floor rather than to a bench. I compromised and got this little guy. 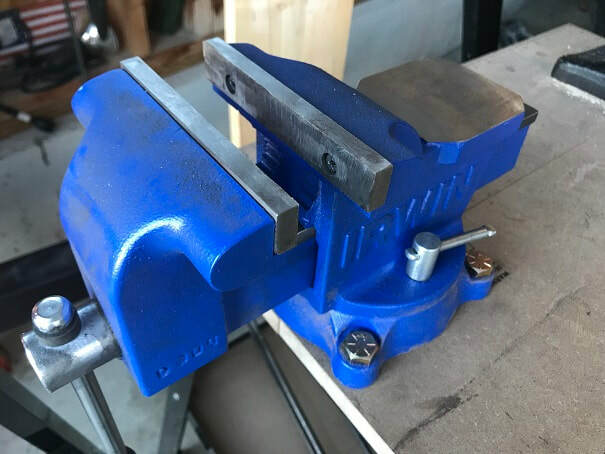 Irwin 5" Bench Vise. Note that I removed the jaws and ground them smooth. These vises come with jaws that have patterns ground into them. These patterns will make marks in hot metal, so I ground them smooth. Here is my backyard blacksmith shop. A small worktable with a 5" vise, along with hammers and hand tools, round out the equipment needed to get started. Not shown, but handy for working metal, is a chop-saw. My chop saw is fitted with an abrasive metal cutting wheel. Hand tools for blacksmithing are shown here.